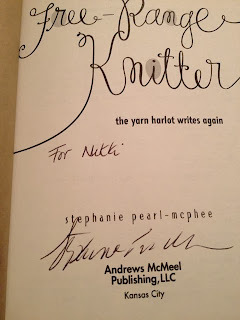 The Yarn Harlot was in Raleigh, NC on Friday and look who went to see her. This picture was taken after she signed my book (Look, our arms are touching!). This picture is real; I didn't even have to photoshop myself into one of her pictures. At one point, I even touched her shoulder as we were posing. I'm never washing that hand again. When a knitting buddy posted on Facebook that Yarns Etc. 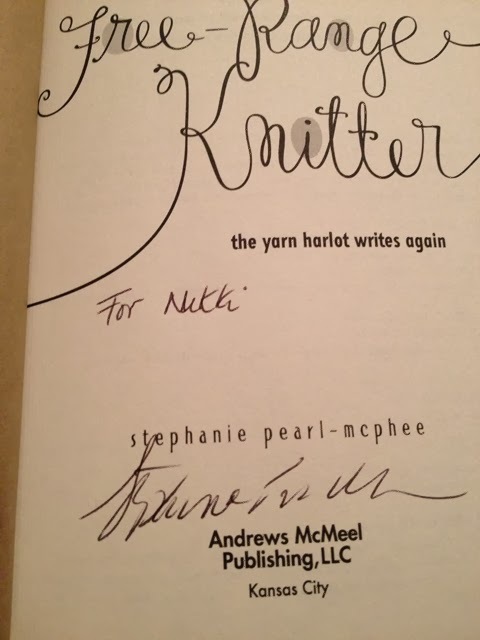 and Great Yarns (two of our local yarn stores) were hosting her, I think I sprained my finger trying to quickly dial to make sure I got a spot. 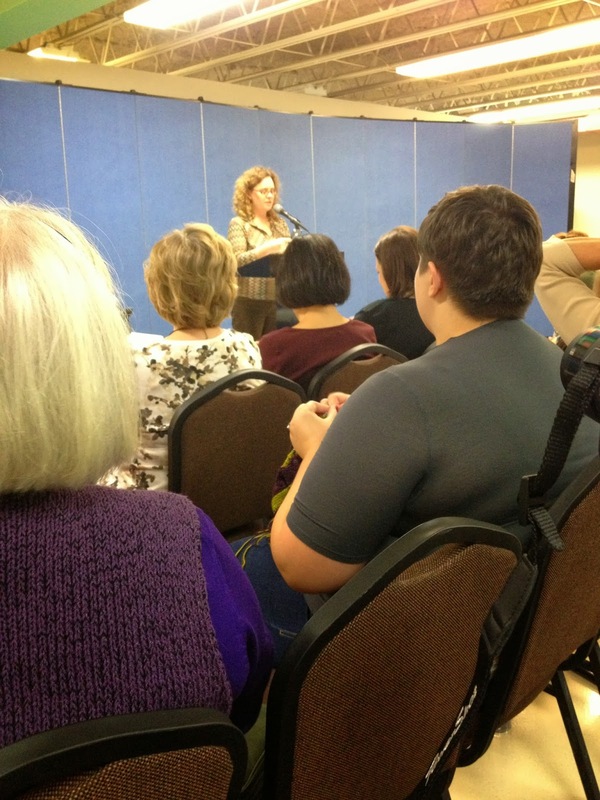 Her talk was from 7-9pm and I wondered what she was going to talk about for 2 hours to keep us entertained. Turns out that I didn't have to worry about that, since she kept us laughing the entire time. 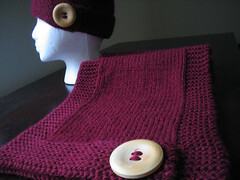 Her storytelling skills are awesome, and she words things in a way that shows she truly understands the knitter's mind. 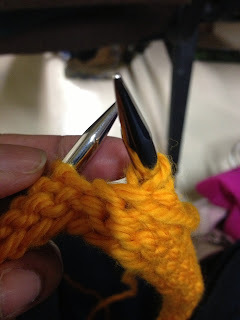 At one point in the talk, she mentioned that being an experienced knitter doesn't mean that you'll never make a mistake again, just that you'll make bigger mistakes faster. A little later, I realized I was screwing up the project I was knitting. Hat in progress. Eventually frogged because it was being bad. I was making a hat that I am designing to go with my shawl pattern, "Cathy's Cowl", and realized that I was incorrectly knitting the garter stitch band. I somehow convinced myself that I'd have to purl every round to work garter stitch in-the-round. You'd think that this was my first time at the knitting rodeo. I saw that the band was curling after about 1.5 inches and thought, "Um, garter stitch isn't supposed to curl.". My brain decided to join the party then I realized that I was knitting in reverse stockinette stitch; you're supposed to alternate knit and purl rounds for garter stitch in-the-round. I was pissed and just threw the thing in my knitting bag so that it could think about what it had done. 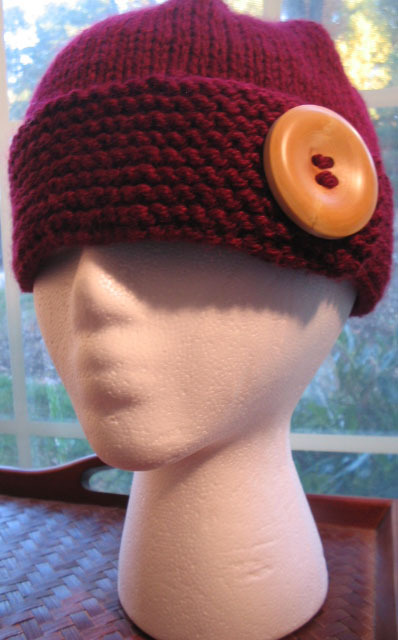 Allowing itself to be knit incorrectly is simply unacceptable. Do yourself a favor and GO see her speak. You won't be disappointed. Cool! Love the natural 'do! And I love that you love it ;D Thanks, Sarah! I'm SO jealous. 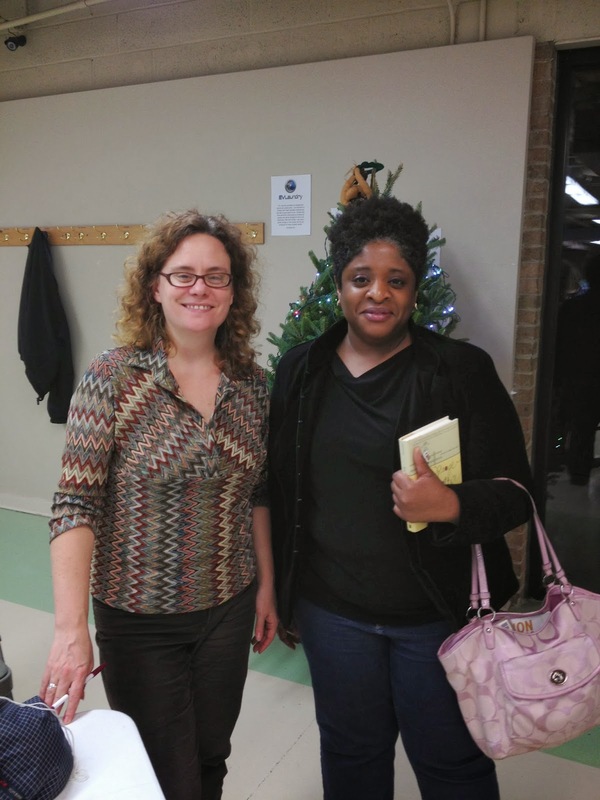 Next time someone signs a book for you, ask them to date it! Thanks for the tip! I didn't even think about that. I was there too!! She is so funny - my sides hurt from laughing. I took the sock class with her. It was great.